As a child whose additional language was English (yes, did you know this is a new ‘inclusive’ term for English as a Second/Foreign language?) my understanding of the word ‘diet’ was limited to a ‘weight loss diet’. In the 70s, it had become a buzzword for grown-ups around me, almost like a fad. Family and folks used it with such natural ease that I didn’t even think it was an English word. Everyone seemed to have an opinion, an anecdote and gratis advice to mete out about 'diets'. Over the years, I fought with my foodophilia and succumbed to many diets – the GM Diet, the Atkins Diet, and the Cabbage Soup Diet – you name it and I was game for it. But alas! These adventures invariably started with ditties and ended in dirges. My calling as a food blogger has seen me ingeniously tiptoeing around recipes with 'sugar/sweetener' options and 'fry/bake' discretions, attempting brilliant coups to overthrow the white supremacy of the butter-sugar-flour clan. But I won’t be honest if I don’t admit that many times these dishes are but shadows of the real McCoys. 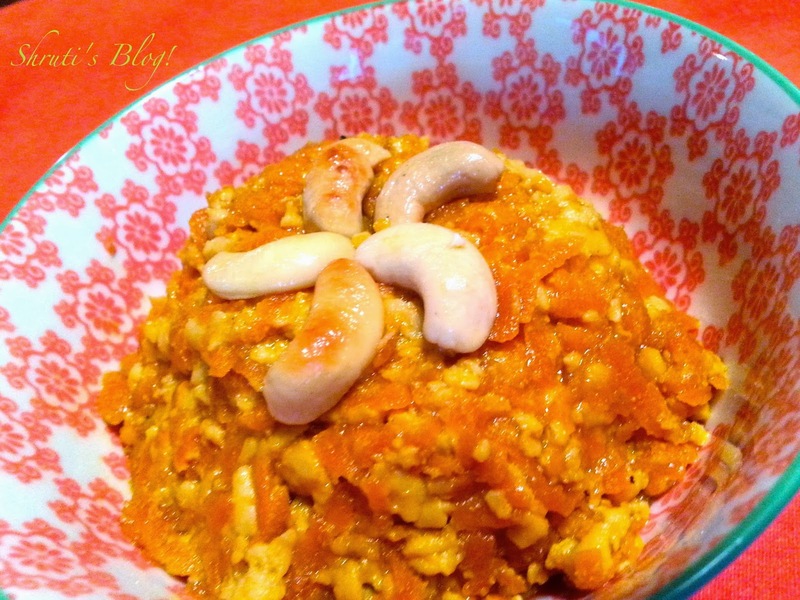 Here’s a “diet” gajar paneer halwa, which cheats in every possible way, but manages to beat the fray! Heat 1 tbsp olive oil in a thick-bottomed pan, and add the cashew nuts and fry them slightly and remove from the pan. Now add the grated carrots and sauté for a few minutes. Add milk and cook on medium heat for about 10-15 minutes or until the milk evaporates and the carrots are cooked. Stir from time to time. Stir in the grated paneer and coconut sugar and cook for two to three minutes or till the sugar melts and mixes well, stirring continuously. The coconut sugar, made from the sap of the coconut palm does not taste like coconut at all. It is not only a low glycemic index sweetening option, but also gives a caramel flavour to the halwa and deepens the colour. Coconut sugar also has nutrients such as magnesium, potassium, zinc, iron, B vitamins, and amino acids. Add some sweetener like Splenda or Agave syrup, if required. Add the green cardamom powder and the tablespoon of ghee (if using). Continue to cook for a minute more. Garnish with halved cashew nuts. Serve warm. Forget the clichéd ice cream.